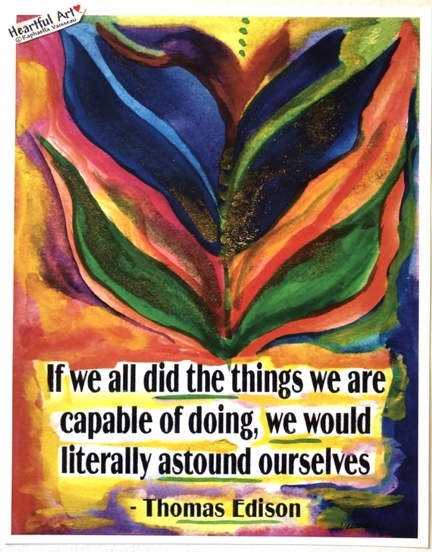 11x14 poster of Thomas Edison's famous quotation "If we all did the things we are capable of doing, we would literally astound ourselves" with art by Raphaella Vaisseau. The art on this print is an opening flower, one of Raphaella's favorite symbols of standing tall, arms outstretched, looking out and up, allowing the genius of creation to flow through, accepting the profound honor of being a vessel of Light, ready to express the beauty of inspiration. We all can do this. Go for it (whatever IT is). Risk. Leap. Believe in yourself.